A solicitor has been jailed for 18 months after he stole £150,000 from two chronically ill patients and from bank accounts of dead clients. 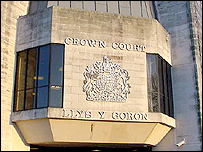 Nicholas Pounder, 46, from Porthcawl, south Wales, used the money to pay off credit card debts Swansea Crown Court was told. He admitted 16 charges of theft, two of false accounting, while 71 similar charges were taken into account. A judge said Pounder, who was "deeply ashamed," had betrayed trust in him. The court heard how Pounder carried out the thefts between 1996 and 2003 while working at David and Snape solicitors in Bridgend. He had been appointed to look after the financial affairs of two chronically ill men by the Court of Protection. But he used their accounts as his own, paying off credit card debts. One of his victims lost £40,000 over six years as Pounder milked his account. Patrick Griffiths, prosecuting, told the judge how Pounder had also stolen from the accounts of clients who had died. Mr Griffiths told the court that Pounder used his position as an executor to "rob Peter to pay Paul". The court heard, he was able to carry out the thefts undetected for so long because he was one of the biggest fee earners for the company he worked for and because he had access to a company client account and a chequebook for which he was the sole signatory. He also generated a false paper trail to make it appear as if the cash was being used for legitimate purposes. Pounder was finally caught after his secretary became suspicious. An internal inquiry was carried out over Christmas 2003 and he was arrested in January 2004. He was formally dismissed from his job shortly later. Peter Heywood, defending, said Pounder was deeply ashamed of his conduct. "You have before you a professional man who has destroyed everything he has achieved in both his profession and his private life," Mr Heywood said. Judge Michael Farmer QC said: "The sad reality is that over six years, you perpetrated a trail of theft on those who trusted you and relied on you. "It was deliberate and protracted..the impact of your behaviour on the public and public confidence, let alone on your victims, is very considerable." At the four-hour sentencing, the judge ordered him to serve 18 months in jail as well as granting a compensation order in the sum of £100,000 in favour of his former employers and ordered him to pay £13,000 prosecution costs.